Light: Becoming debt-free. Having more than enough to get by. Making contributions to a savings plan. Taking a new job with an eye toward advancing your career. Buying life or health insurance. Being confident in the bedroom. Taking on the role of enforcer when called upon to do so. Shadow: Becoming so conservative you resist all change on principle alone. Ignoring innovations in the name of preserving tradition. Being smug or cocky. Becoming ruthlessly dedicated to profit or pleasure. Being sexually selfish. Bossing others around, especially when you’re not empowered to do so. Personality: The King of Coins can represent anyone who tends to control (King) finances and physical resources (Coins). The King may also represent the tendency to be more conservative than innovative, or the need to intervene on the behalf of others with less confidence or experience. Story: The Main Character must persuade conservative or traditional people to try a new approach, or must spurn tradition in order to succeed. Relationships. Money trouble can ruin romance; dedicate yourself to handling funds (especially mutual ones) responsibly. Planning for a future together can be exciting and even arousing. Express physical affection with boldness. When circumstances dictate, be prepared to speak up or take action in your partner’s defense. Work. This card points to a need for a conservative approach to making and spending money. Stay on budget. Find ways to reduce costs. These measures don’t have to choke innovation and fun; they just call on you to be more creative with the resources you do have. Spirituality. Allow your spirituality to inspire financial and physical responsibility. Take great care to honor the money you’ve been given. Take special care of your body, and see it as an instrument of the Universal Will. Lend your resources to those who earnestly need your help. Personal Growth. Mature souls handle money and relationships responsibly. Before spending money, consider the consequences. Before becoming physical with someone, consider the potential outcome of your actions. Live in the moment, but cultivate an awareness of future events your present actions could call into being. Fortune Telling. 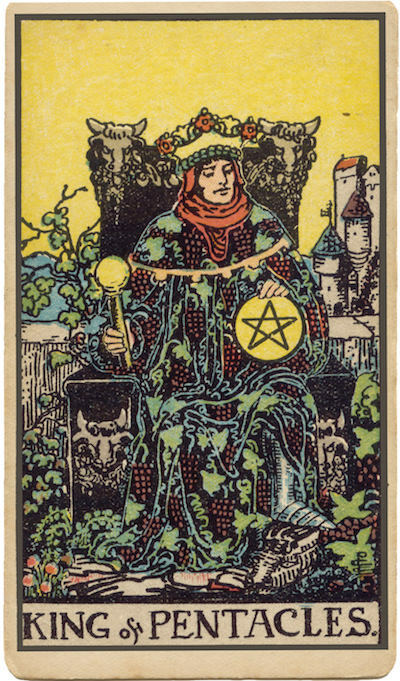 This card represents an older man with a financially, socially, and politically conservative spirit, likely born between August 12th and September 11th, who is known for putting his money where his mouth is. When? Between August 12th and September 11th. The Harvest Throne. The King of Coins frequently sits on a throne draped with vines and grapes—a reminder of his intimate connection with the forces that create abundance. How might a conservative approach today help you achieve greater abundance and wealth tomorrow? Controlled Luxury. No excesses here; the King of Coins enjoys his comforts, but he keeps them in perspective. How do you assign value to the objects around you? If you sense that physical things are becoming too important, what should you do? Lessons Learned. One way to control (King) the physical realm (Coins) is to restrict those actions that disturb the status quo. How might being physically or financially conservative be an advantage now? How might shattering that control lead to positive outcomes? The Marseilles Image. The Marseilles King of Coins exudes a confidence that comes from knowing the Coin in his hand isn’t the only Coin at his command. When you’ve taken measures to make best use of your physical blessings, you can enjoy them without becoming their slave. How can you handle expenses with greater confidence and maturity? How dependable are you? How dependable would others say you are? To what extent is a conservative viewpoint valuable? At what point does it become more of a burden than a blessing?